Neil added that shooting for Saaho is a challenging experience as it is a trilingual. Last year, the much-loved Prabhas added a new dimension when ‘Baahubali 2’ opened to a thunderous response at the box office and received rave reviews along the day. Directed by ace filmmaker SS Rajamouli, the film featured ‘Darling’ in a double role and served as strong proof of his abilities as an actor. Released in April, it became a global phenomenon and put Telugu cinema on the world map like never before. Talking about the film’s success in the Hindi belt, actor Shahid Kapoor had said that the team deserved full marks for successfully breaking the language. “It’s great to see cinemas are breaking barriers of languages, Koi film Hindustan main jo achieve kar pa rahi hai, Its very beneficial for entire industry and wish all the success to everybody involved with Baahubali. Kam se kam hum iss scale ki movies attempt kar rahe hai and somebody (SS Rajamouli) is backing it and spending time to make it. So it’s very inspiring and we all are inspired and we all are going to work harder to make better movies,” he had added. Now, with ‘Baahubali 2’ in the rear view, Prabhas is working on ‘Saaho’. The film is touted to be an action-thriller and is being directed by Sujeeth. Not surprisingly, it has already created a buzz amongst fans courtesy its gripping poster and is one of the most eagerly-awaited films of 2018. 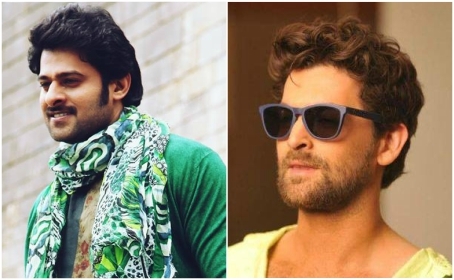 During a recent event, Bollywood star Neil Nitin Mukesh –who will be making his Tollywood debut with this one—said that ‘Saaho’ is shaping up quite well. He also added that shooting for it is a challenging experience as it is a trillngual. “Saaho’ is shaping up really well. It is a bit difficult to shoot for that film because at one time, you have to shoot for Hindi, Tamil and Telugu as it’s a multilingual film. But I am learning a lot during the course of its shooting,” he added. Besides Prabhas-Neil, ‘Saaho’ also has Bollywood diva Shraddha Kapoor in the lead. Waiting for Saaho!!! Can’t wait to see Prabhas on screen again!! Anxiously waiting to watch the handsome & talented Prabhas on screen again. Wishing team Saaho all the luck & success.